"He has poured his heart into this farm." 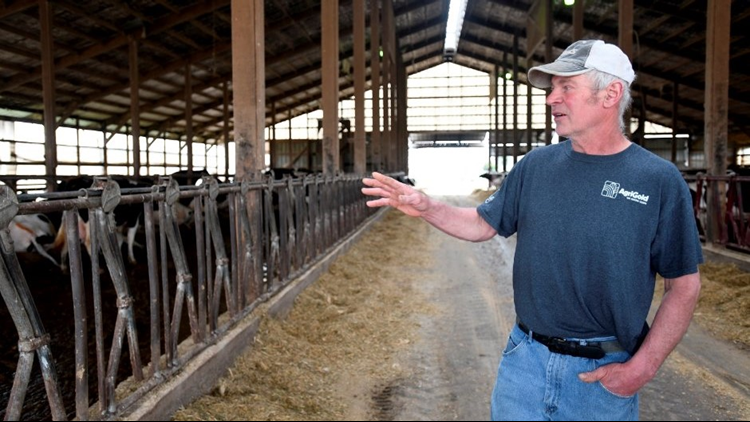 Dwight Raber, of Raber Dairy Farms in northeast Ohio's Stark County, said he's losing money and can no longer make a living doing the work his father, grandfather and great-grandfather did before him. His farm, which has grown to 500 acres (200 hectares) over the years, was founded by his great-grandfather who came to the U.S. from Switzerland in 1891. Raber said he needs to make at least $16 per 11.6 gallons (44 liters) of milk to break even, but he's been stuck at $13.89 for the past two years. "He has poured his heart into this farm," said Raber's wife, Julia Raber, an English teacher at East Canton High School. "He just goes and goes, 24/7. But it's time to slow down; it really is. His mother also told him, 'Please don't ruin your health.'" "The trend is alarming," said Dianne Shoemaker, an Ohio State University extension field specialist in dairy product economics. Cheaper milk flowing into the state from Michigan mega-farms has contributed to the pressure Ohio dairy farmers have felt, Shoemaker said. While 2014 year was a boom year for Ohio dairy farmers, it's been bad for four years in a row, she said. Raber acknowledged he's "a little scared" about making the change from dairy farming, but said beef cattle require less maintenance. That extra time will allow him to tidy up the property. "This was a showplace," he said. "I want to return it to that."